In a fascinating game for neutrals but an excruciating one for Sharjah Sports Club for Women, the Al Fuhays team from Jordan scraped the narrowest of victories in the final minutes of their second round match, beating the hosts 70-66 and putting them top of the table in the process. On the second day of the Arab Women's Sports Tournament 2018 (AWST), the Jordanians took a formidable early lead, finishing the first quarter 22-10. But the Sharjah Sports ladies regained their footing and reduced the difference to one point by the end of the third. However, the seasoned Al Fuhays team managed to cling on in the dying minutes to just keep Sharjah at arm's length. The Al Fatat team from Kuwait has had its first taste of victory in the AWST basketball event, with a comprehensive 82-55 win over Jeddah United. The match saw Kuwait compensate for their loss in the first round having been beaten by Sporting Team from Egypt, while Jeddah United maintain their losing streak following defeat on the opening day against the Sharjah Sports ladies 30-90. While Al Fatat dominated the court for the first three periods, winning 24-13 in the first, 23-11 in the second and 18-13 in the third, to the credit of Jeddah United, they fought to the end, winning the fourth quarter 17-18. Kuwait's win came on the second day of the fourth - and largest - edition of AWST, which runs until February 12, under the patronage of the wife of His Highness the Ruler of Sharjah, Her Highness Sheikha Jawaher bin Muhammad Al Qasimi, Chairperson of the Sharjah Women Sports Foundation (SWSF). The second round of the preliminary phase was completed with an inspiring display from Bahrain's Al Mawaheb, who put Somalia's Mogadishu team firmly in their place from start, culminating in 76-58 victory. The Bahraini performance was outstanding as they dominated the three of the quarters by 21-14, 22-17 and 24-17, and rally from Mogadishu proved to be far too little, far too late. The teams have a day off to rest, and resume play on Wednesday where Al Fatat are up against Al Mawaheb from Bahrain at 12pm; Jeddah United play Al Fuhays from Jordan - one of the favourites to win the title - at 2pm; and the Mogadishu club from Somalia take on Egypt's Sporting Team. 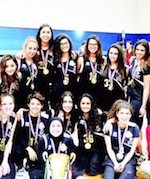 The AUK Women's Basketball team triumphed in the University Athletics Association of Kuwait (UAAK) finals. Playing in the finals opposite the Australian College of Kuwait (ACK), they earned the winning title with an impressive score of 29-19. This is the 4th year in which AUK has participated in this league, and was among several universities and colleges in Kuwait competing for the championship. Led by coach Wessam Mohammad, the team's efforts did not go unnoticed as he praises their performance throughout the competition, 'We approached all games with the same mentality as a final game, we got better all the way to winning the championship. Special thanks to Dean Hanan Muzaffar and Mr Omar Mehdi for their great support; to all the fans who stood by our side throughout the tournament. And finally, thanks to all the players for their determination, desire and unselfish play.' The team displayed outstanding athleticism and drive throughout the season, and went undefeated in all their games. Somalia registered the second win at Pan Arab Games in Doha. They held off Kuwait to improve at 2-2 record in the ladder. Somalia now share the third position with Jordan. Somalia will take on Jordan tomorrow. Somalia stunned their opponents in the first frame. The African side went on a 22:9 run to leave their opponents behind. The margin grew at 16-point mark at halftime 36:20. Kuwait tried to stay in the game in the third quarter. They trimmed the deficit to 14 points with ten minutes remaining 36:50. Somalia however quickly boosted the gap to 20 points and never looked back en route to the win. Manal Cali (F/C-86) provided 20 points, 8 rebounds and 5 assists for Somalia. Qamar Abdi Mohamed (G-87) netted 13 points in the win. Mashael Almarzouq (C-79) answered with 17 points and 10 rebounds for Kuwait. Laila Behbehani (C-86) had 10 points, 8 rebounds and 8 assists in the loss.